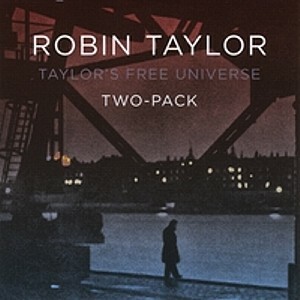 Robin Taylor - "Taylor’s Free Universe Two-Pack"
This is Robin’s latest release and what a cool little package it is. A two pack of 3” CDs! Great little packages with 22 and 23 mins of music (3 tracks each). The first one is music from 2006 and the other from 2010. Dark City from 2006 starts things off with some intense guitar and sax (Karsten Vogel) and Assi Roar laying down some killer bass as well. It gets even cooler when Pierre comes in with the electric violin and counters Robin’s guitar. Rasmus Grosell is laying down the drums in these sessions, which were recorded at the Oyster Studios by Karsten Vogel. While it is pretty improvised and free form, they maintain a great interaction and don’t really enter into the super noisy realm that local stars, Jørgen Teller and the Empty Stairs do. I like this track a lot. Don’t You Miles Me is next and I guess this is supposed to be a hint towards Miles Davis, or not? Robin has added some effects to his guitar on this one and both he and Karsten have toned down their playing as everyone finds their place and begins to feel comfortable with the song. Pierre is slowly mixed in from below becoming louder and more integrated into the track as it evolves. Rasmus and Assi are solid but not as adventurous in this track. Assi does have this really cool bass sound though and Robin really experiments with the guitar. About 5 mins in they space out a bit. I like the ending. The 2nd 3” CD recorded in Sept 2010 has three tracks and starts with the 5 min Heavy Friends and features a totally different band and Robin plays most of the instruments (guitar, bass, keyboards, percussion) and Klaus Thrane plays the drums and we have Jacob Mygind on sax on this track. As Robin is playing most of the instruments these tracks are quite composed compared with the other CD, which is very improvised. The Ghost of Göran is next and has Louise Nipper on vocals and Carsten Sinvald on soprano and tenor sax. It starts with mainly keyboard and sax as it slowly builds up. Just when you think it is going to end some bubbling sounds start and piano and other things start to creep into the sound and the synth pad grows louder and the sax returns and now the drums kick in. It slowly fades out into space at the end. Stoned Mushroom is the last track and clocks in at just over 7 minutes and is more uptempo and a bit hypnotic at times. While the track slows down in the middle, it has a fantastic sax solo towards the end by Jakob. If you are a fan of Robin’s you will for sure enjoy this.